Black hats really are the devil to photograph, I must say. I have always liked the phrase dicing with death. My husband Alan uses it to tease me when I am going overboard with my anxiety. I have explored the skull theme off and on for a few years now. Jax Teller and all that, I suppose. 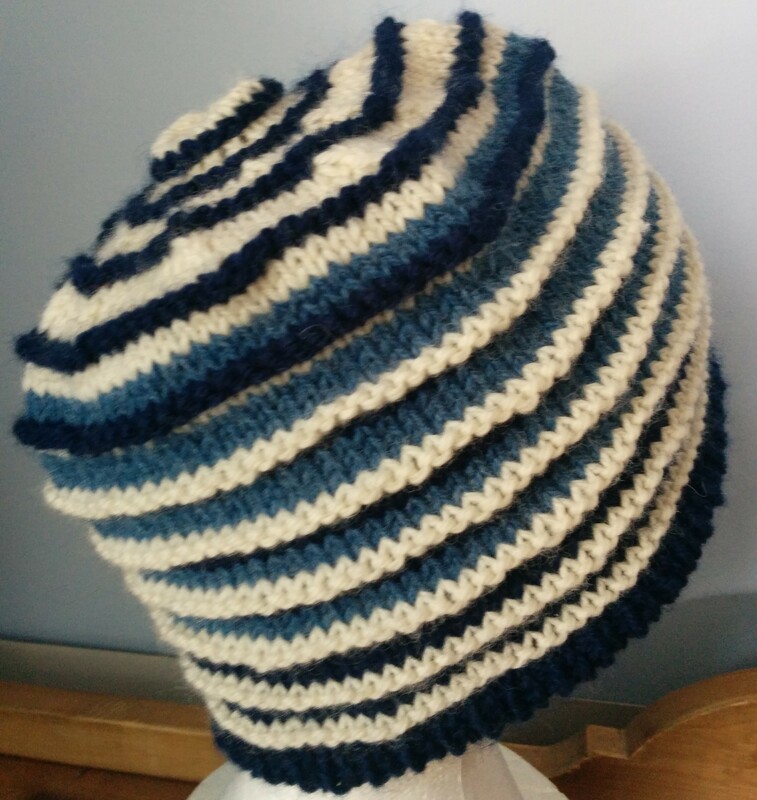 As a matter of fact, the first post of this blog was done because I got very positive response from my original skull hat and thought the hat blog idea may be ok. I was in an airport lounge on my way to Peru in October 2015 and texted my kids for something to put on a hat. Heather responded with #YOLO. I thought then that skulls went with the theme of “you only live once”. When I was recently asked for skull hats by my son and a brother in law, I speculated I could give one of them the #YOLO hat I already have. Shot down immediately. Apparently, according to the same daughter who originally proposed the idea 15 months ago, no one would be caught dead in a #YOLO hat now…it’s so last year. But wait, what happened to wearing outdated things ironically…I guess that is SO last week. Or maybe things have to be at least a decade out of date to qualify for ironic wearing? Kids these days, I swear. Hard to keep up for us oldsters. Wait, whare have I heard THAT before? 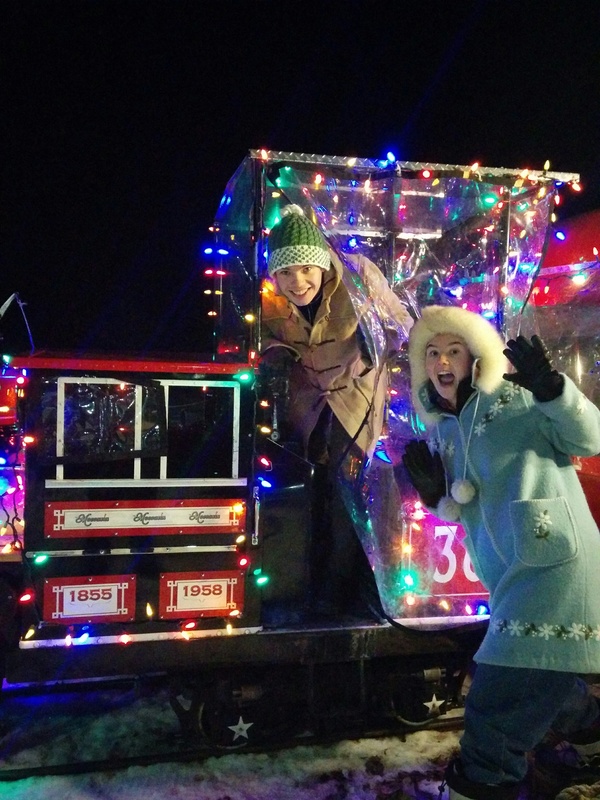 Oh, well…good thing I made that hat reversible, just in case something like this outdating thing happened. For these new hats, I decided to go with the skulls and dice idea. How could that possibly go out of style after all? I was originally going to use Barbara Walker’s eyelet dice patterns, but after two days of futile trying, I gave up on the concept and just went with dice that I drew. Jake’s hat: I cast on 100 stitches and did 4 rows of garter stitch to try (unsuccessfully) to stop the stockinette curl before increasing to 110 and doing the skull/dice band. After the colour work I decreased back to 100 stitches. Also, because of the terrible curl, I went back and picked up a set of stiches from the back of the garter stitch and brought some k1 p1 ribbing up the back of the headband and rejoined just before doing 4 rows of garter stitch. I increased again to 112 for the Slipped Hourglass from pg 110. I have found that if you don’t increase/decrease between plain stockinette and/or garter stitch bands and bands of patterning/colour work which draw in, you get rippling, so I do it automatically now. Jake liked the hat with the double layer brim. He has to walk around in the cold on his way to classes and whatnot so the double layer on his forehead and ears works well. 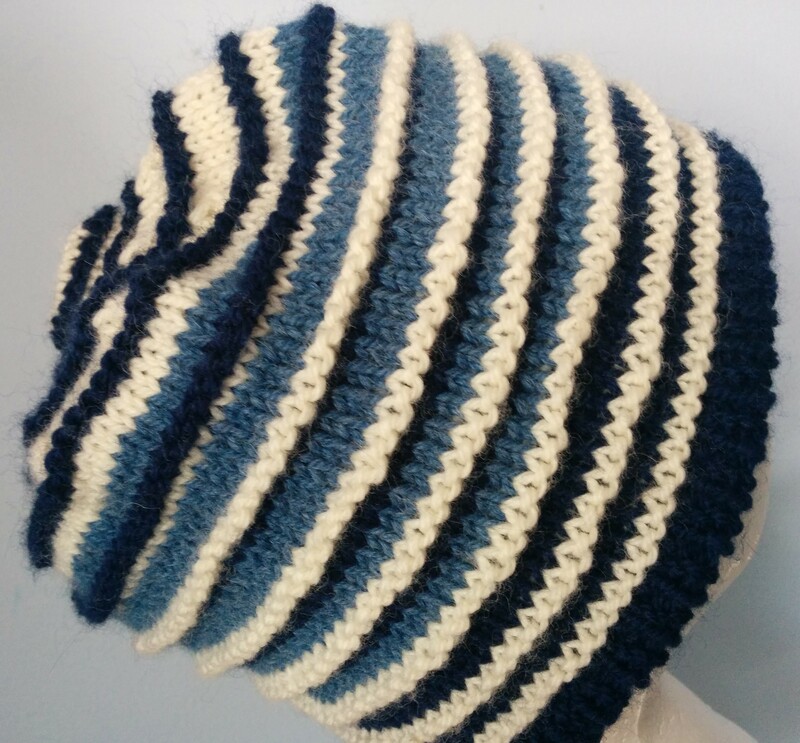 Chris’s hat: I cast on 112 stitches on straight needles and did two repeats of the Banded Rib Pattern, pg 123, then I decided I liked the “wrong” side better at this point which was handy as I could do it on round needles this way. 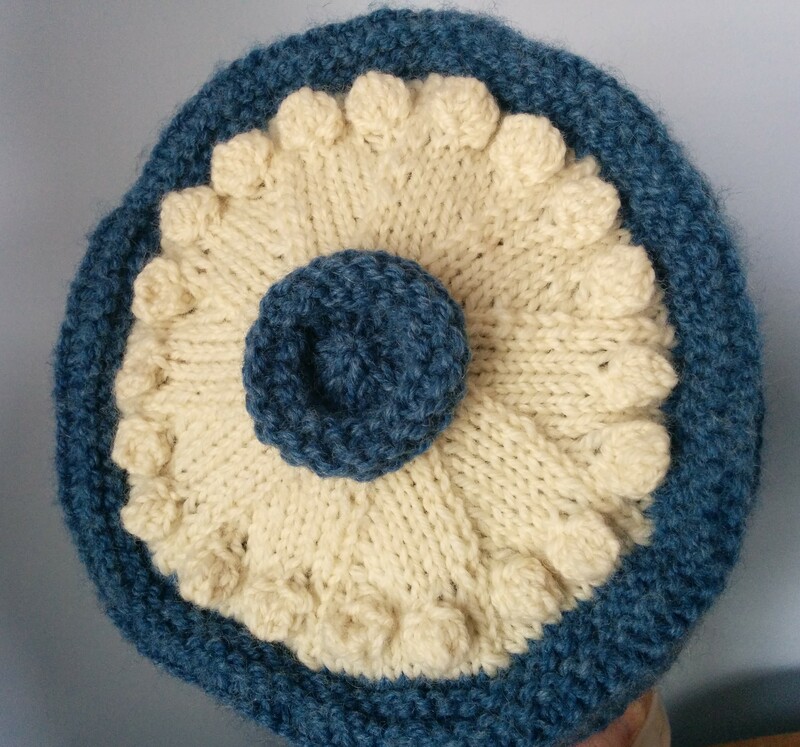 There is only one pattern row which has to be worked and I wasn’t sure if I could work it from the “right” side in the round. I went to a round needle at this point and did the skull/dice band. I went with 4 skulls and 4 sets of dice, where I had used 5 on Jake’s. I had felt the colour work a bit crowded on his. I also changed (improved?) the skulls a bit, adding a nose and a row of black between the teeth rows. I went back to banded rib and decreased by getting rid of every 7th four stitch repeat, then every 6th, then every 5th. I originally finished it this way (every 4th, 3rd, etc) but got a weird cone on the top, so I ripped back and got rid of every other repeat instead of every 4th, then, after a pattern row just did ssk, k2tog around, then one row plain and k2tog around once before finishing it off. I decided not to do a double brim because Chris is more of a car to building guy, and the double brim would be too hot. 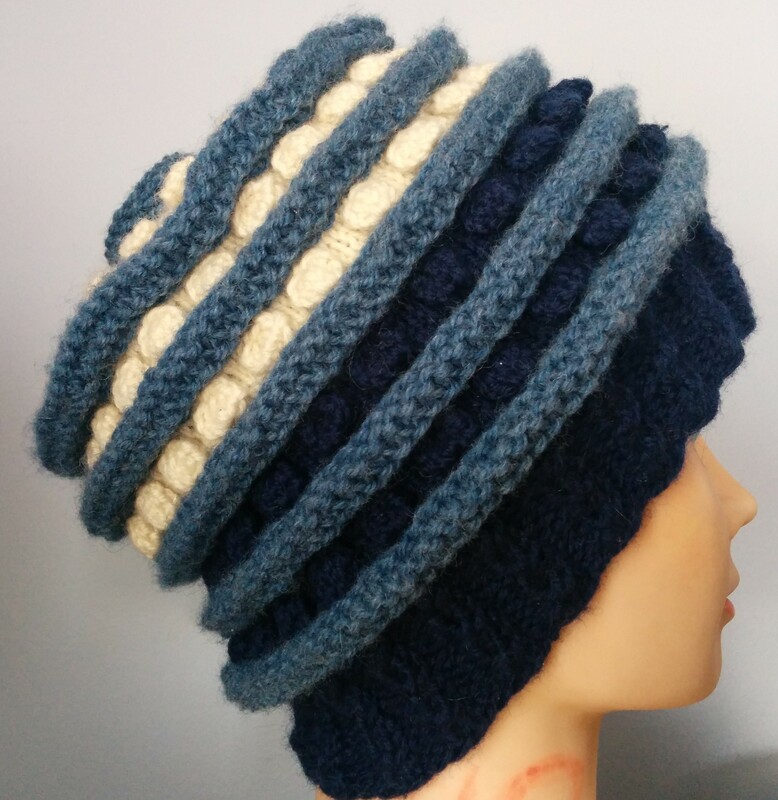 This entry was posted in Barbara Walker and tagged A Treasury of Knitting Patterns, Barbara Walker, Cascade 220, hat, knitted hat, knitting, Knitting and Crochet, skull hat on January 8, 2017 by gillianknitter. I have been giving the red and white yarns a run for their money this past couple of weeks. I decided after making the rude/not rude hat for Jake last week that I would make a Canadian Christmas hat. This just says Merry Christmas in our two official languages. I decided not to bother with any negative sayings on this one as I am feeling quite good about Christmas right about now. 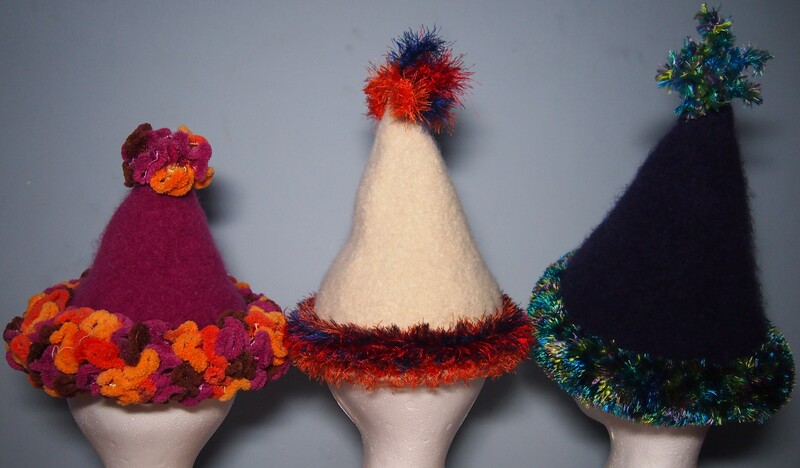 I have been making a family set of Santa hats which I will show when our little family is finally together next week. Jake is finishing his exams and coming home on Wednesday. 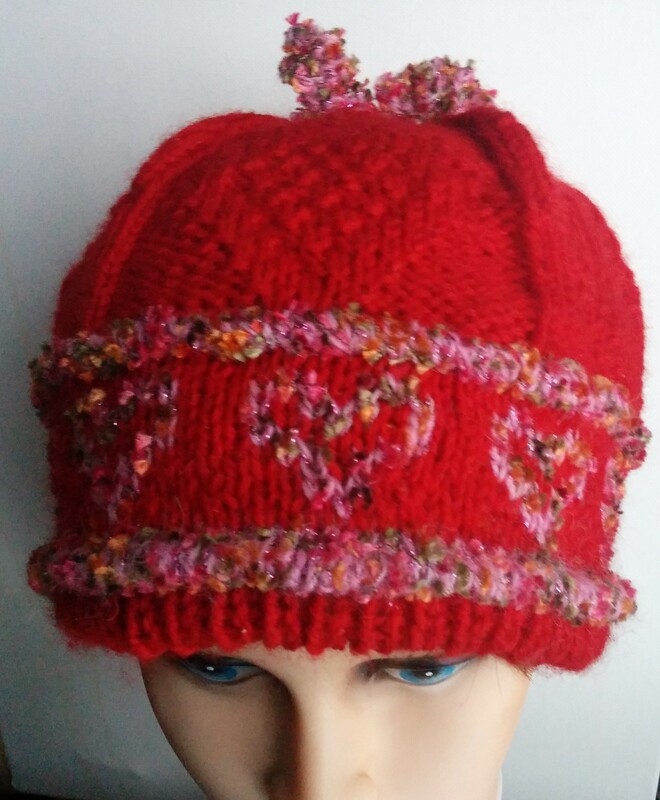 This hat uses two Barbara Walker stitches, Seeded Chevron from page 27 for the reversible red crown and Banded Crescent Pattern, pg 110 for the inside brim. 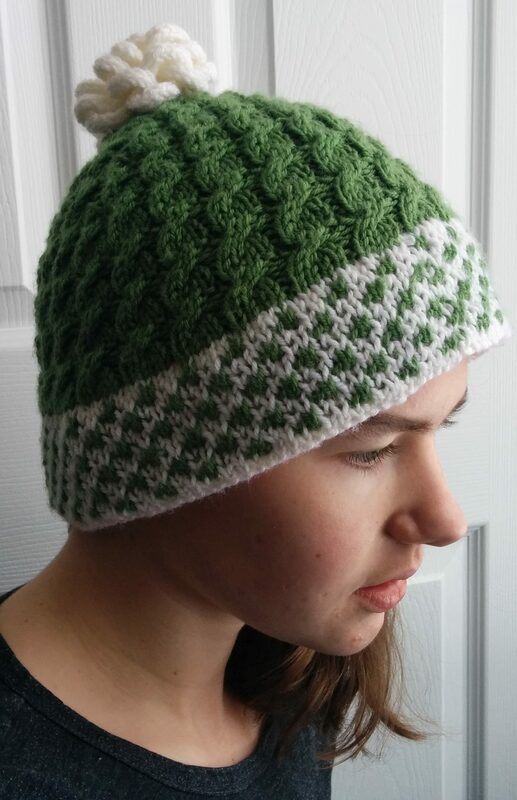 This entry was posted in Barbara Walker and tagged A Treasury of Knitting Patterns, Barbara Walker, Cascade 220, hat, knitted hat, knitting, Knitting and Crochet on December 17, 2016 by gillianknitter. A while ago I was watching the Australian Open tennis and there was a match between Stan Wawrinka and Novak Djokovik. The courts were blue, and both men were wearing blue shirts, a symphony of blue. 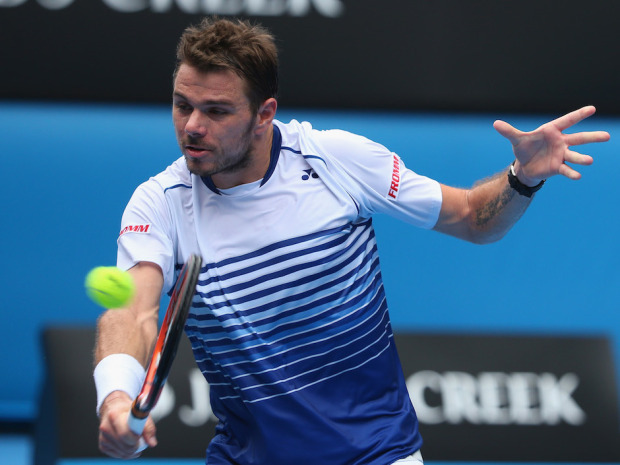 Being big on colour, I loved the look of the whole thing, but was especially captivated by Stan Wawrinka’s shirt. As you can see, it is deep blue at the bottom, transitions through a light blue in the middle, and into white at the top. 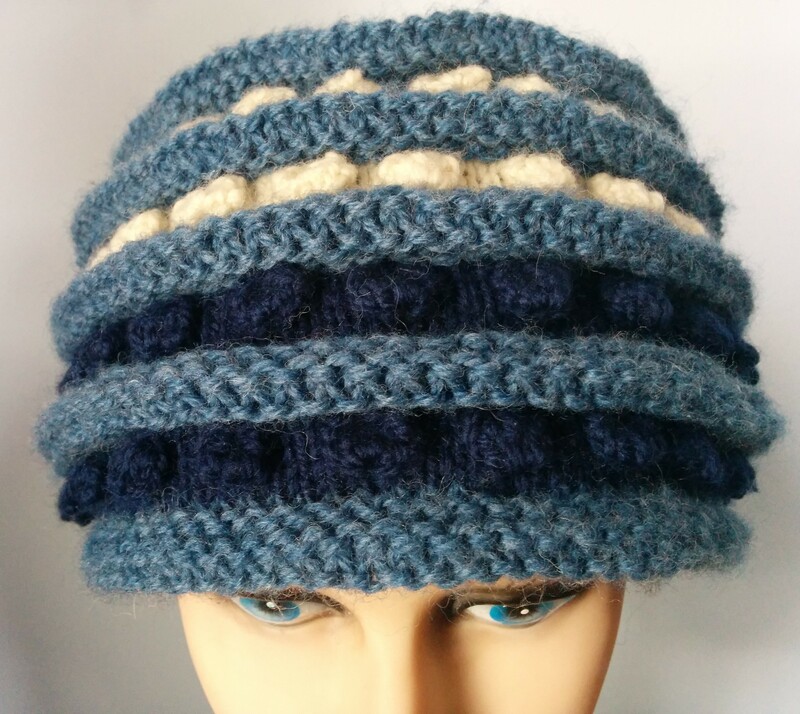 Since that day, three of the hats I have made have been trying to capture the feeling of this colour shift. These three views show my first attempt. I was just going on the impression I had in my memory of the shirt. BTW, I will show you more of these sculptural hats I have been doing over the next few weeks. I have been on quite a knitting binge and have a lot of hats in the back of my car getting frozen in case moths may lurk in the house. Did I mention the freezer I bought to keep the hats in…lets just call the car the overflow catcher…freezer is getting full. |I guess I should have bought a bigger one. This is the last hat in my ode to Stan Wawrinka series, but my first in the tribute to Barbara Walker series. I have decided to do a kind of Julie/Julia thing with Barbara G. Walkers first book, A Treasury of Knitting Patterns. It has over 500 patterns in it, so I decided to put a whole bunch in the first one. This hat is actually a stitch sampler. 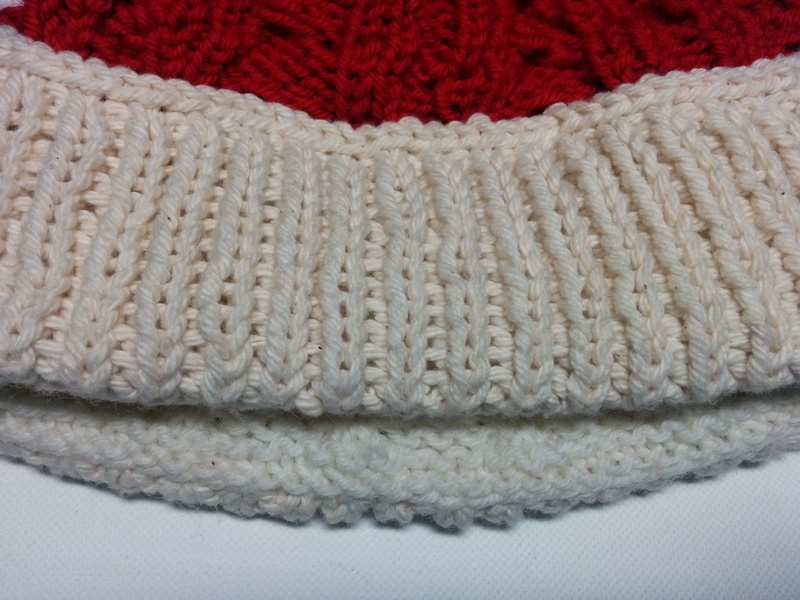 From the bottom it covers garter stitch, stockinette stitch (three variations-plain, twited and crossed), seed stitch, moss stitch, double seed stitch, dot stitch, sand stitch and knit 1 purl 1 ribbing. I thought the hat might be a good way to get a lot of the boring stitches over with in one fell swoop. 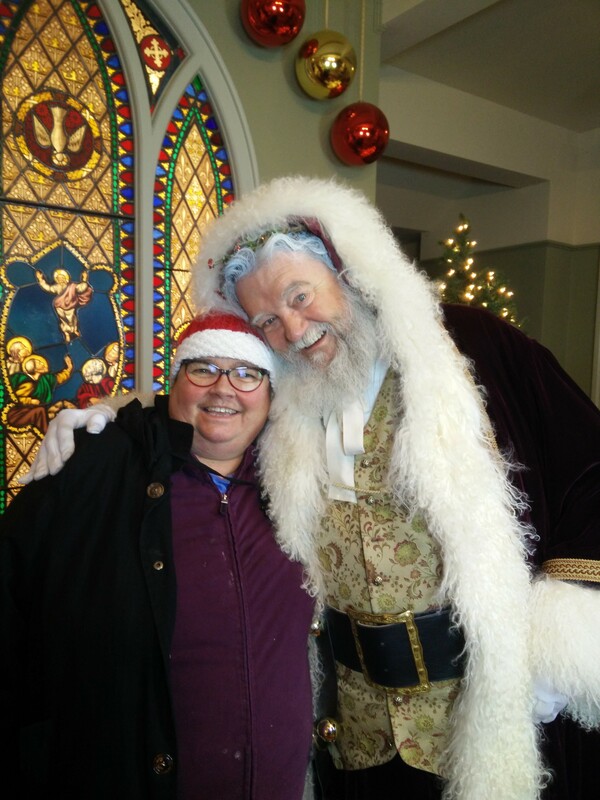 And I am even happy with it as a hat…bonus points! The rules of the challenge will be that any project must use the next pattern that appears in the book, the caveat being that I can use the next one in any one chapter or several chapters together. This will hopefully give me a modicum of artistic discretion. 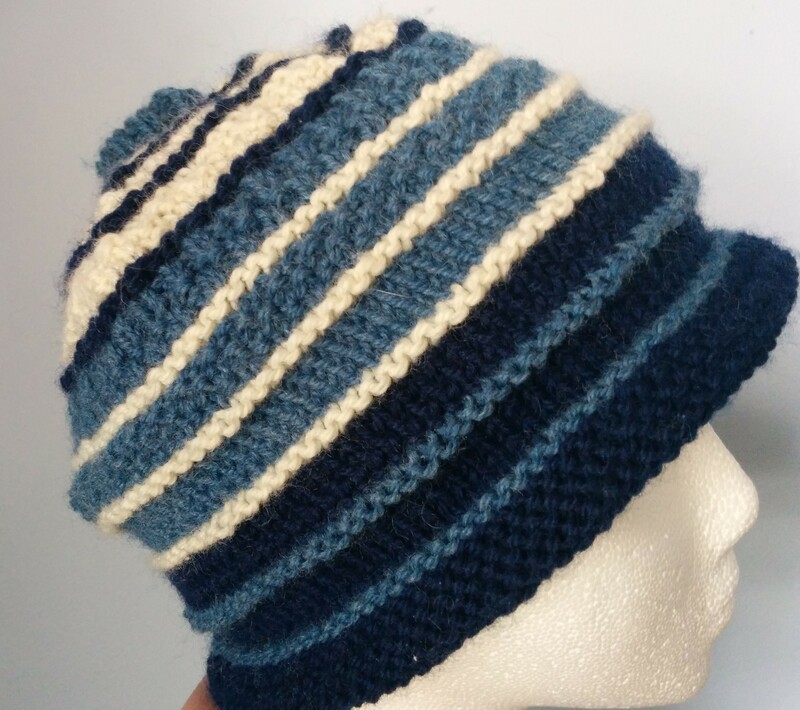 This entry was posted in Barbara Walker, sculptural and tagged hat, knitted hat, Knitting and Crochet, kntting, Patons Classic Wool, Stan Wawrinka on February 26, 2015 by gillianknitter.